Karim Bakhtiar's Blog: John Prescott: "I don't care... Bugger Off You Amateur!" 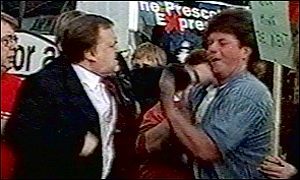 John Prescott: "I don't care... Bugger Off You Amateur!" John Prescott (British Deputy Prime Minister): Why are you asking me about this? I don't care. It's a Welsh situation. I'm a national politician. Mark Choueke (Reporter): Are you too big to care about the Labour voters in Blaenau Gwent? Do you think there may be something in your party's methods of working that require a rethink when a politician chooses to stand against you after 35 years service to Labour? John Prescott (British Deputy Prime Minister): (walking away) Where do they get these amateurs from? You're an amateur mate, go get on your bus, go home. Mark Choueke (Reporter): Are you too big for the regional press now John? John Prescott (British Deputy Prime Minister): Bugger off. Get on your bus you amateur. Mark Choueke (Reporter): Is my interview over John? Because if that's all you've got to say, that's what will go in the paper. Ooohh, I'm scared, go ahead, put it in your paper.